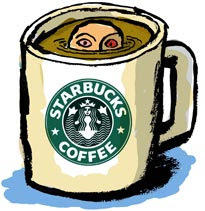 Weighty Matters: I have something nice to say about Starbucks! Starbucks has gone and created a fancy coffee that's not the caloric equivalent of a quarter-pounder. It's called the "Skinny Latte" and it's made with skim milk and sugar-free syrup. They come in multiple flavours including cinnamon dolce, mocha, vanilla, hazelnut and caramel. A tall version of any will run you about 90 calories. Nice to have a lower calorie fancy option. CalorieLab reported on a Starbucks blog where a barista complained about the use of the term "skinny" and how she felt it was a politically incorrect term to use as it might be upsetting to folks who work at Starbucks who aren't skinny.